So I had the unfortunate experience of watching my Dell Inspiron decide not to power up or charge the battery. I could tell it was due to some short in the electrics because every time I plugged in the light on the adapter would go off. 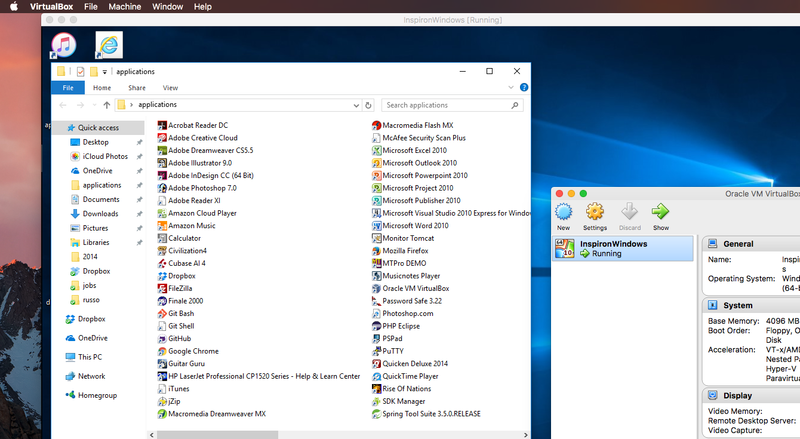 I have both VirtualBox and VMWare on my MacBook Pro with my VMWare used primarily for the Bootcamp install of Windows 10. All of that aside, I was looking for a solution that would allow me to use my Dell (Seagate) drive as a VM on my Mac. I have the software tools just need the know-how. After a series of looking around the Internet for solutions. Second, I had to extract the drive from the Dell Inspiron. After a bunch of screws and totally disassembling the laptop, I pulled out the drive. Third, plug the old laptop drive into the enclosure and into my Mac. It works, and I can read the drive using the Mac Finder. I, however, still need to access programs on the disk that were installed to that Windows on the Dell. 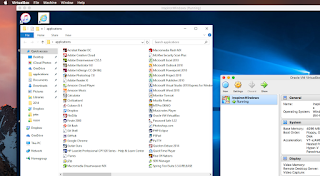 There are no direct ways via the GUI of either VMWare or VirtualBox to launch a bootable drive as a virtual machine using the canned processes for starting a new VM. 2. Use Mac Disk utility to unmount the partitions of the drive. Otherwise you get VERR_RESOURCE_BUSY errors. Failed to open the disk image file ~/VirtualBox VMs/dell.vmdk. then provide user and privileges to the vBox image via Mac using chown and chmod in the Terminal. Current user (presumably you) must have ownership over the vmdk file you create from the previous step and has to have -rw permissions. 6. 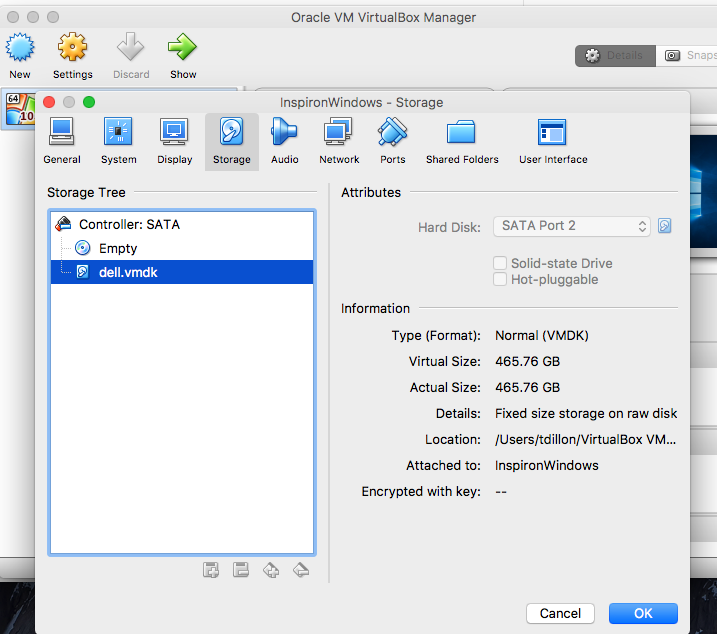 Attach the new vmdk image to the VirtualBox as a SATA controller. Interesting that since my old Dell was dual boot (Ubuntu and Windows) I still have the option to boot into Ubuntu when I start up this VM. May the words of my mouth and the meditations of our hearts be acceptable in your sight O Lord, our Rock, Our Redeemer. Now, despite what my mother would say about me and if you might have high expectations of me, let me lower them for you some—maybe quite a bit. Despite what some people might say about all the great things you might expect from me, you just might be here for someone else. John is getting people motivated by preaching about the perils of political hypocrisy, deliverance and liberation. People start envisioning extravagant thoughts and spreading the news about this John-fellow baptizing people in the Jordan while calling for repentance and rejection of hypocrisy. Even though, they have heard similar from Isaiah and Ezekiel, John sounds refreshing, albeit revolutionary, to these oppressed people. He is saying some revolutionary stuff like 1) to share, 2) to do fair business, and 3) to not extort.— very revolutionary! Also, some people get afraid, very afraid. King Herod also heard this messiah story who is to be the “deliverer of the Jewish nation” (e.g. perhaps challenge Herod’s authority like Moses did in Egypt), and Herod doesn’t like power challenges— especially from some guy in the wilderness. II - Reflection on Baptism. A large part of this text tells how John would baptize people using the water of the river Jordan. This is where we, as Christians, base the Sacrament of Baptism not just thanks to John, but because Jesus proceeds to be baptized by John — beginning his ministry in the lands of Roman-occupied Israel, and then later instructing his Disciples to go out and baptize. Why is baptism so important? Believe me, when people get baptized, there are some expectations. Namely, that you recognize the mystery of Jesus and God in your life, and through the waters of baptism, we are born into the body of the Church. What possibly could go wrong here? Why did Jesus find it necessary to be baptized prior to His mission? Perhaps Jesus saw John bringing powerless people to God via baptism. Perhaps, Jesus was showing a sign of solidarity with sinners. Yet, like the Church says, Baptism is the mark of our acceptance (the sign and seal) of one’s participation in God’s forgiveness, a beginning and new growth into Christian faith and life. We are told that Jesus is beginning to fulfill His mission & growth with God as well. So when you recognize God, you can always find forgiveness, compassion, and fulfillment. I am reminded that Baptism is not just about the lives of individuals being baptized, but also a celebration and renewal by the whole church. As people growing in the church, we also have the opportunities to “re-affirm” that which may have been done for us in baptism as a child and to confirm our covenant with & faithful recognition of the Church and God. Water is used to symbolize cleansing, if not actually, because water comes from God and only through God might we be truly cleansed. The water helps wash away and just let go. The power of water in baptism becomes no less dramatic to us as to open the heavens to Jesus. I am compelled to tell the story of a young man who was baptized at Plymouth. (I should note that this is a public baptism in front of the whole congregation during worship, and the congregation is invited to renew their baptismal covenant as well). This gentleman decided to join Plymouth after many great experiences and be baptized. He proceeds to the front of the Church for the baptism. As he received baptismal waters, he just opened up like a sunflower glistening towards the sun. He was glowing with tears of absolute joy, and total elation flowed from him. (Those tears flowed through the congregation that day.) This was truly a memorable experience—a “conversion of the heart.” I was glad to witness it. This happened because in baptism, there is a “conversion of the heart” happening (as John tells us) only by letting go of what we thought we knew (i.e. expectations). Then, you can let God’s love fill you and maybe you witness the light upon you too! That is transformational power. Now, Should Herod be so scared of this power? Can we expect to have that kind of baptismal conversion throughout our lives, instead of that one moment? Can we understand how suffering can completely transform into grace? When we ask God to be in our lives, there are many things possible. Perhaps it is better that people know the real deal is coming and it is not me! You do not have to worry about having low expectations of me because there is someone far better than I waiting for you. Your baptism covenant is evident of this. Perhaps, it is better that people recognize how God and Christ can make true differences in our lives when we let go and open ourselves to the possibility. Let Go of your Expectations! Open your hearts to your baptism, to God and to the possible— rejuvenate your faith. You just might find your expectations filled.